See her SSRN author page. Marie Manikis joined the Faculty of Law of McGill University in 2013 and teaches Criminal Justice, Criminal Law, Sentencing, and Criminal Procedure. Her research interests include criminal law, criminal procedure, human rights, victims, sentencing, and criminal justice. Professor Manikis’ scholarship is interdisciplinary, comparative and uses social science methodologies to advance the available knowledge in criminal law and criminal justice. For her current projects she has been awarded several research grants including a SSHRC IDG, FRQSC, a Fondation du Barreau grant, and the France-Canada Research Fund. 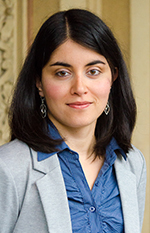 Her work has been published in leading peer-reviewed journals and was presented at several conferences and seminars, including for judicial training seminars with the National Judicial Institute (Canada), the International Society for the Reform of Criminal Law, the British Association of Comparative Law, the World Society of Victimology, as well as Canadian, British, American and French Universities. She completed a DPhil in law in 2014 at the University of Oxford under the supervision of Professors Andrew Ashworth and Carolyn Hoyle. Her doctoral research compares and analyses the enforcement and redress mechanisms available in England and Wales and the United States in response to victims’ rights breaches. It was supported by the SSHRC, the FQRSC, the Maple Leaf Trust, the Peter Birks fund and the Modern Law Review. During her doctoral studies, she taught graduate tutorials in criminal justice at the Centre for Criminology at the University of Oxford and was a Visiting Researcher at Harvard Law School. In 2008-2009, she taught tutorials on the Canadian Charter of Rights and Freedoms and judicial review at York University. Prior to this, she practiced law in Montreal and clerked for a Superior Court Justice. Finally, Professor Manikis has been interested in the development of evidence-based policies and has provided consultation reports based on her research to the Department of Justice in Canada, the Ministry of Justice in England and Wales and the Canadian Senate. Professor Manikis is happy to supervise graduate and postdoctoral students working on topics that relate to victims, sentencing, criminal law and criminal justice. Marie Manikis, “Conceptualizing the victim within criminal justice processes in common law tradition” in D. Brown et al. (eds), in The Oxford Handbook of Criminal Process, (Oxford University Press, 2018) (forthcoming). Marie Manikis, “Expanding participation: A comparative approach to victims as agents of accountability in the criminal justice process” (2017) 1 Public Law 63-80. Marie Manikis (with Peter Grbac), “Bargaining for Justice: The Road Towards Prosecutorial Accountability in the Plea Bargaining Process” (2017) 40:3 Manitoba Law Journal 85-110. Marie Manikis, “The Difficult Road to Accountability: A Study on Complaints Mechanisms to Investigate and Address Victims’ Rights Violations” in J. Desrosiers et al., Criminal Law Reform in Canada: Challenges and Possibilities (Yvon Blais, 2017). Marie Manikis, “Towards Accountability and Fairness for Aboriginal People: The Recognition of Gladue as a Principle of Fundamental Justice that Applies to Prosecutors” (2016) 21 Canadian Criminal Law Review 164-184. Marie Manikis, “The recognition of prosecutorial obligations in an era of mandatory minimum sentences of imprisonment and over-representation of Aboriginal people in prisons” (2015) 71 Supreme Court Law Review 277-300. Marie Manikis. “Imagining the future of victims’ rights: A comparative perspective” (2015) 13:1 Ohio State Journal of Criminal Law 163-186. Marie Manikis, “Victim Impact Statements at Sentencing: Towards a Clearer Understanding of their Aims” (2015) 65:2 University of Toronto Law Journal 85-123. Marie Manikis (with Julian V. Roberts), “Victim Personal Statements: Latest (and last) Trends from the Witnesses and Victims Experience Survey in England and Wales” (2013) 13:3 Criminology and Criminal Justice 245-261. Marie Manikis, “Navigating through an obstacle course: The complaints mechanism for victims of crime in England and Wales” (2012) 12:2 Criminology and Criminal Justice 149-173. Marie Manikis, “Recognizing Victims’ Role and Rights During Plea Bargaining: A Fair Deal for Victims of Crime” (2012) 58:3-4 Criminal Law Quarterly 411. Marie Manikis (with Julian V. Roberts), “Recognizing ancillary harm at sentencing: A proportionate and balanced response” (2011) 15:2 Canadian Criminal Law Review 131-144. Marie Manikis (with Julian V. Roberts), “Victim Impact Statements at Sentencing: The Relevance of Ancillary Harm” (2010) 15:1 Canadian Criminal Law Review, 1-29. Marie Manikis, (with Jo-Anne Wemmers), « Le dédommagement dans le système de justice pénale » (2017) Research in Brief, Justice Canada, (forthcoming). Marie Manikis and Ivana Isailovic, “Au delà des catégories? Les nouvelles normes en matière de changement de sexe” (2016) 4 Contours, 70. Marie Manikis, Interview on joint submissions at sentencing following R. v. Anthony-Cook, 2016 SCC 43, The Lawyers Weekly. Marie Manikis (with Kaitlyn O’Shaughnessy), “The Mandatory Costs of Mandatory Minimum Sentences in Canada”, Oxford Human Rights Hub, 19 April 2016. Marie Manikis (with Julian Roberts), “Mandatory minimum sentences don’t work. They can’t work”, The Gazette, 13 January 2016. Marie Manikis, Interview on Bill C-32 and its impact in criminal law, The Lawyers Weekly. Marie Manikis, Consultation on a Proposed Federal Victims’ Bill of Rights, Ottawa: Department of Justice (September 2013). Marie Manikis, Consultation on Improving the Code of Practice for Victims of Crime, London: Ministry of Justice (April 2013). Criminal law, human rights, victims, sentencing and criminal justice.